The Newcastle North Stars had been there before but for the Perth Thunder this was the first time they had stepped out onto the hallowed ice that is AIHL Finals hockey. The Thunder looked focused and Coach Stan Scott knew that his team could beat the North Stars, which they had done once this year on home ice however standing in his way was a Gary Dore coached Newcastle side who are confident under pressure. As the puck dropped the Thunder came out swinging, putting the North Stars on the back foot. The North Stars appeared to have trouble settling into the match as wave after wave of Perth attack lead by Kenny Rolph had the North Stars scrambling. In a move that shocked many Coach Dore got his third line out on the ice who have been solid all year and the move worked as the withstood the Thunder’s relentless attack. You have to sit back and think that likes of Wetini, Quirk and Stanger have played Finals hockey before and know what’s required. At 10.34 remaining in the first period, the Thunder got a power play opportunity when, Matt Wetini was sent to the box but instead of staying back in their own zone and defending, the North Stars attacked which paid off when at 9.34, Pier-Olivier Cotnoir slipped the puck past Daniel Clarke for a short handed goal and a 1-0 lead. The game was going end to end with both sets of defensive teams working overtime to keep the puck out of their zone showing the crowd at the Icehouse some great finals hockey. With 4.52 remaining in the first period, the Thunder had another great power play opportunity when John Kennedy Jr was sent to sample some pine. The North Stars managed to hang on and kill the penalty. 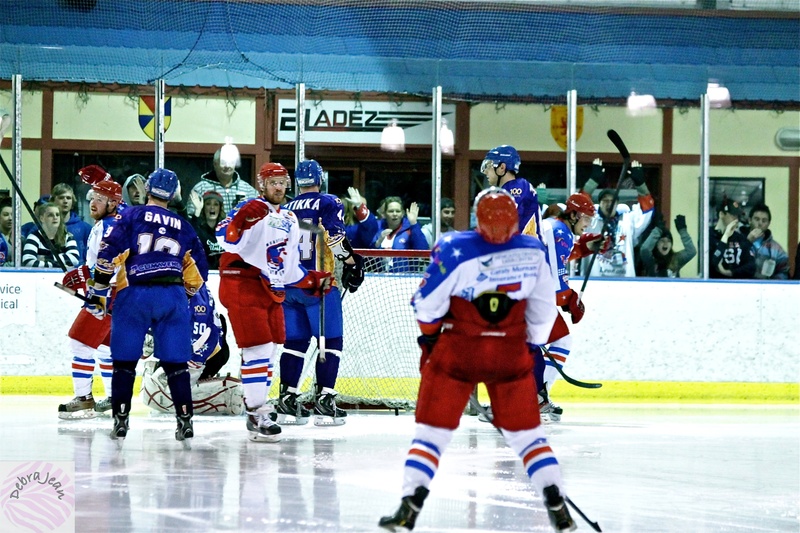 The Newcastle imports were settling into the match and the likes of Dominic Osman, Jeff Martens and Cotnoir started to control the neutral zone. At 2.45 remaining in the period Jeff Martens showed why he was the leading AIHL point scorer when he found the net and made it 2-0. With 1.32 remaining in the first the North Stars got their first power play when Sam Wilson was the first Perth player to grab pine giving Perth it’s first opportunity to penalty kill. The second period opened with the North Stars still on the power play but credit must go to Perth who held the North Stars out. At 14.05 the North Stars again had the power play opportunity when Dan Mohle was sent to the box. Mohle, who with Rolph had looked dangerous throughout the match was testing Olivier Martin every time they got a shot on net. Newcastle grabbed the opportunity of the extra man and at 13.47, Pier-Olivier Cotnoir bagged his second play-offs goal for a 3-0 lead. The North Stars appeared to be on a roll which became more evident when Dominic Osman fired a shot at 9.57 which beat Clarke, giving the North Stars a 4-0. The Thunder never gave up with Rolph giving his all at the front and a Perth goal was waved off at 7.05 when Olivier Martin’s net dislodged about four seconds before the puck was fired in. Although the goal was waved off it boosted the confidence of the Thunder attack. With 0.30 remaining in the period, Sam Wilson became the first Thunder player to score a goal in the AIHL Finals series when he dragged the score back to 4-1. The third period would be twenty minutes of frantic hockey. The Thunder knew what they needed to get back into the game and Newcastle knew what they needed to do to move onto the Grand Final. Every player on the ice threw themselves into every shot, pass and body check. The hits were solid but clean which had the crowd roaring at the Icehouse and at home on the Livestream. The North Stars Beau Taylor, who had shown speed and maturity on the ice was the next to taste a finals goal when at 7.35 he gave the North Stars a 5-1 lead. It would be 40 seconds later that Pier-Olivier Cotnoir would seal the Grand Finals berth for Newcastle when he grabbed a hat trick and a 6-1 victory. Cotnoir summed it up, “It was a good win, they came out with such intensity but we regrouped and weathered the storm. We are an older team and many of us have played big games before which helped. To win tomorrow we need to match the Ice Dogs intensity and score more goals”. The Thunder had a taste of finals hockey and we can only imagine will be back for more. They played hard and will know what they need to do next year to make the next step. Many sense it is a matter of time. The North Stars progress to a Grand Final against the favourites for the 2013 Goodall Cup, the Sydney Ice Dogs. In what will be an epic match, we know the Goodall is coming back to NSW for a visit. This entry was posted in Uncategorized and tagged AIHL, Dominic Osman, Ice Hockey, Jeff Martens, Newcastle North Stars, Perth Thunder, Pier-Olivier Cotnoir, Sport on September 8, 2013 by craigtonks. The Canberra Knights travelled north with one thing in mind, to take three points from the Newcastle North Stars and stop the flood of goals that derailed their season. Craig Tonks caught the action for HSN. The first period opened with some great exchanges between both teams which saw driving into the opposition zone and making the shots on goal. A penalty against the Knights at 11.57 for too many players on the ice opened the door for the North Stars to run a power play line, paying dividends at 11.47 when Pier Olivier Cotnoir slipped a puck to Jeff Martens to open the scoring at 1-0. A slap-shot from the blue line by John Kennedy Jr at 9.07, delivered Newcastle’s second goal however Canberra had the answer at 8.56 when a goal mouth scrap resulted in Matt Taylor dragging the score back to 2-1. With 7.01 remaining in the first period the defending North Stars turned defence into attack when Jeff Martens fired a puck up the ice to Dominic Osman who was patrolling the blue line which resulted in a 3-1 score in favour of the North Stars. To the credit of the Knights who never took a step back, they kept working the puck and asking questions of the Newcastle defence. This paid off and put Canberra back on the score board when Jordan Braid combined with Jordan Gavin to take the teams to the break with a 3-2 score. The second period began with sustained pressure from the North Stars with Canberra goal tender Chris Slauenwhite denying the North Stars several times until 12.11 when Dominic Osman fired a shot from the blue line on a power play which rebounded off of Jordan Braid allowing Osman to take a second shot and securing Newcastle’s fourth goal. Just over a minute later Jeff Martens jumped on a lose puck to take the score to 5-2 however Canberra hit back at 8.25 when Jordan Gavin slipped one past Newcastle goal tender Olivier Martin yet the celebration was soon forgotten when Dominic Osman bagged another goal to make the score 6-3. Osman soon went from scorer to assistant when at 0.47 he turned provider for Pier Olivier Cotnoir to close out he period with a 7-3 lead for the North Stars and minus a few players when a flurry of gloves flew with 4 seconds to go which saw five players enjoying pine time. The third period began with where it left off with Dominic Osman bagging his fourth goal of the game at 19.32 which took the score to 8-3 however Canberra kept fighting back resulting in a Kai Miettinen goal at 10.19. Even though Canberra were down on the scoreboard they kept asking questions and making shots on the Newcastle goal, with the persistence again paying off with 3.46 remaining in the game when Jordan Braid grabbed his second goal for the night and in doing so bringing the difference back to two goals and a 8-5. As the clocked ticked down, North Stars young guns Matt Wetini and Jayson Chalker combined to give Wetini a much deserved goal to close the match out at 9-5. The Knights can take many positives away from a loss, one being that not matter how far behind they got, they fought their way back which would be pleasing to any coach. Newcastle Coach Gary Dore summed up the importance of the game, “We had to win this game, that’s really all there is to it”. 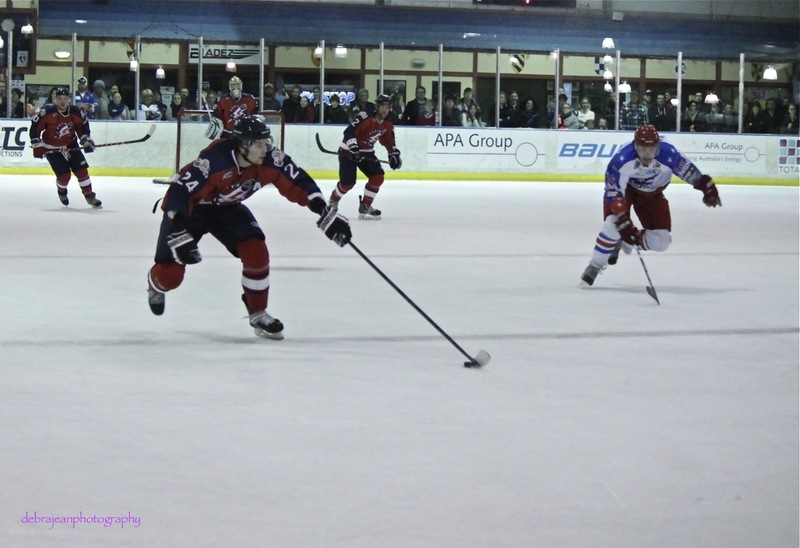 This entry was posted in Game Reviews and tagged AIHL, Canberra Knights, Debra Jean Photography, Dominic Osman, Ice Hockey, Jeff Martens, Newcastle North Stars, Sport on July 30, 2013 by craigtonks.